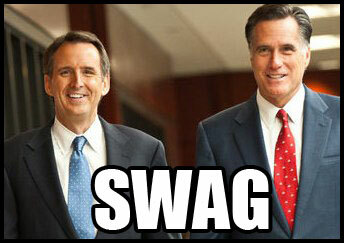 AverageBro: Who Should Mitt Romney Pick As His Veep?!? Who Should Mitt Romney Pick As His Veep?!? The more I struggle to stay awake during this election season, the more I realize how totally lame it is when compared to 2008. That year had the prospect of history in the making (Barack & Hillary), blatant race-baiting, rabble rousin' black preachers, the fall of a political dynasty, crowds of 100,000+, cheesy pop songs, and an out-of-left-field VP selection that still lingers 4 years later like a bowl of chitins'. This year... not so much. Romney's as plain vanilla as they come, Obama's a plain ole' politrician (and not a particularly great one), the "attack" ads have been almost entirely based on the candidates' records (the horror! ), and the words "Rebb'n Wright" have yet to actually surface. While pundits claim this has been a "vicious campaign cycle full of reciprocal attacks", I don't see it that way at all. A party ain't a party till someone get's accused of "palling around with terrorists". Mitt Romney will soon unveil his VP pick, and unlike 2008, there don't appear to be any gamechanging surprises on the horizon. After a short-lived presidential bid of his own last year, Tim Pawlenty is again being considered for the Republican ticket. His fate is in the hands of Mr. Romney, a rival-turned-friend, who is on the cusp of announcing his vice-presidential selection. Mr. Romney has reached a decision, his friends believe, and he may disclose it as soon as this week. If Pawlenty is not the nominee, two other experienced and lackluster potential VP nominees include Ohio Sen. Rob Portman and outgoing South Dakota Sen. John Thune – two equally uninspiring but safe choices. More exciting but untested names like those of Florida Sen. Marco Rubio or Louisiana Gov. Bobby Jindal appear to be dropping further down on the shortlist of potential veep picks. The selection of one of the above candidates yields several advantages to Romney – he avoids being “upstaged” by his vice presidential candidate. Certainly not a rock star himself, Romney could be done a disservice by one of the more fiery Republican officeholders that have been mentioned as possible vice presidential candidates who could overshadow his candidacy. Furthermore, a Pawlenty or a Thune on the ticket would avoid what some pundits have called the “mistake of ’08.” That is the perception among political observers that Sen. John McCain’s selection of Alaska Gov. Sarah Palin in 2008 provided a boost of enthusiasm in the short term for McCain. But Palin’s lack of experience or ability to speak extemporaneously about complex subject matter caught up with the campaign. Question: Any thoughts on who Romney will/should pick for his Veep?! ?